The hot, dry summer months, along with increased camera use during vacation adds up to lots of dirty sensors. Considering that most photographers have likely never cleaned their sensors, it’s a sure bet that most digital cameras in use today have a significant amount of debris on their sensors. Not your camera, you say? Trust me, if you have never cleaned your sensor, it’s filthy – you just don’t know it. And don’t say to me, “But I never take the lens off…” either… Camera systems are not hermetically sealed. All brands and models are prone to contamination when used regularly. Ironically, the bigger the sensor, the more likely it will attract dust. Since most photographers shoot between f/4 and f/11, they don’t realize that their sensors (actually, the anti-aliasing filter protecting the sensor) are dirty. At that range the depth of focus is relatively shallow so any dust on the sensor may not be visible. Once you start shooting at f/16 and smaller, it’s quite likely you will start noticing dust spots. Especially in areas that have consistent tonal values, ie: the sky. or should you attempt cleaning it yourself? 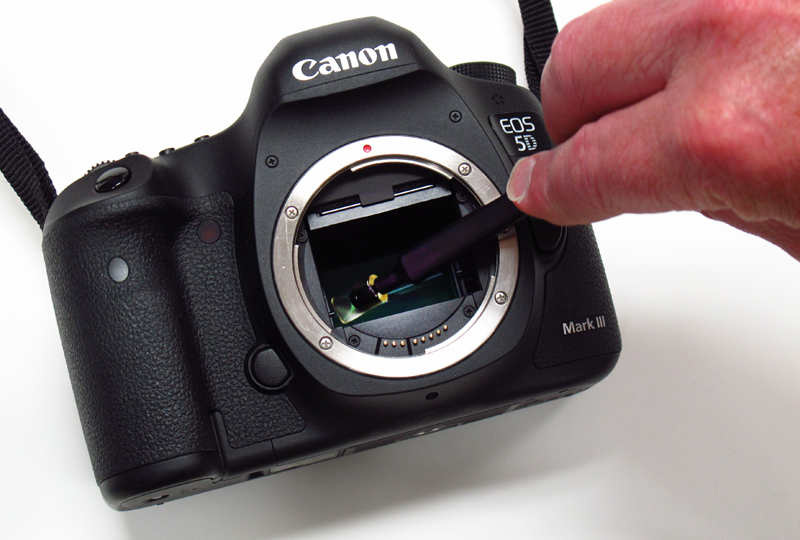 Frankly, it’s not that scary or difficult and you can easily clean your own sensor with the right materials. The first step is to determine if you actually NEED to clean the sensor at all. 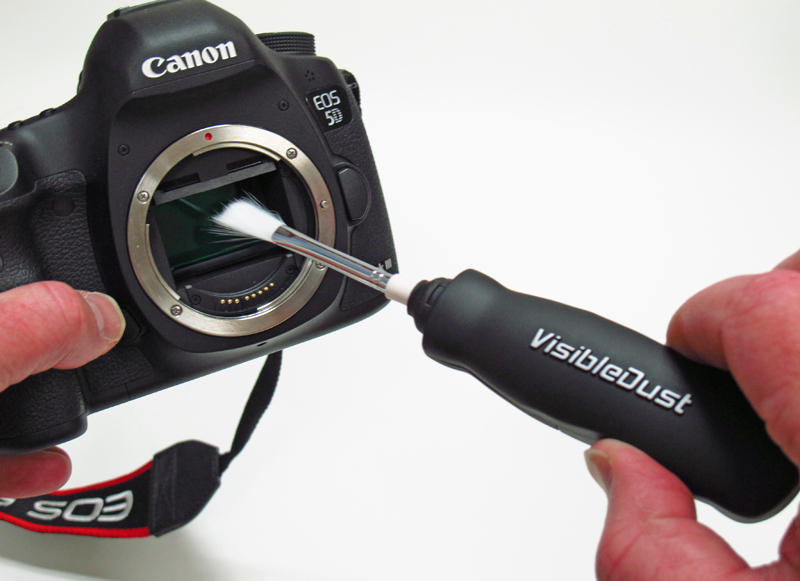 Although there’s certainly some dust on it, you should only attempt a cleaning if there’s visible dust on your images. 1) Attach your longest lens and rack it out to it’s maximum focal length. 2) Set your lens to manual focus. Now focus the lens to its closest distance. 3) Set your camera to Aperture Priority (Av) at it’s smallest aperture (ex: f/22, f/32) at ISO 200. 4) Take a photograph of a neutral colored / non textured subject. 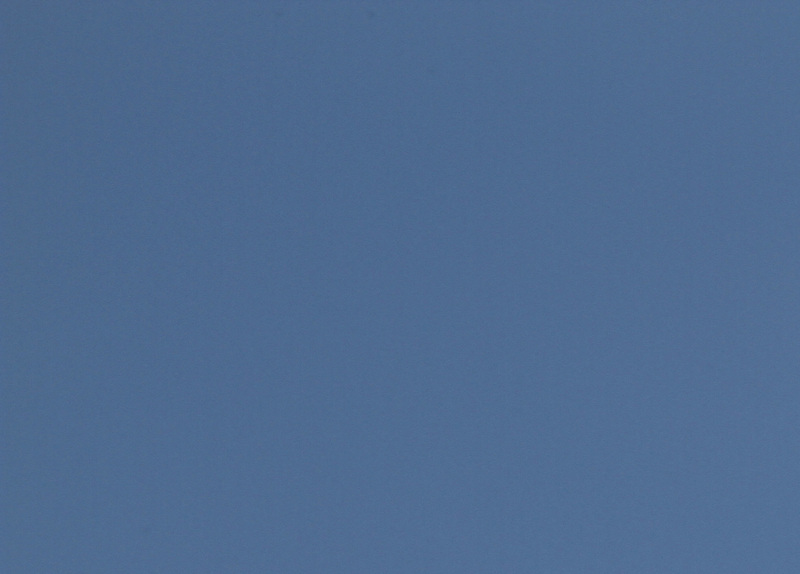 I usually photograph a patch of clear blue sky, or a piece of paper. The image should NOT be in focus and a long shutter speed is OK.
5) Review the image on your camera’s LCD monitor. Zoom in to 100% magnification and inspect it. If you’re at home, it’s easier to review the test image on your computer. 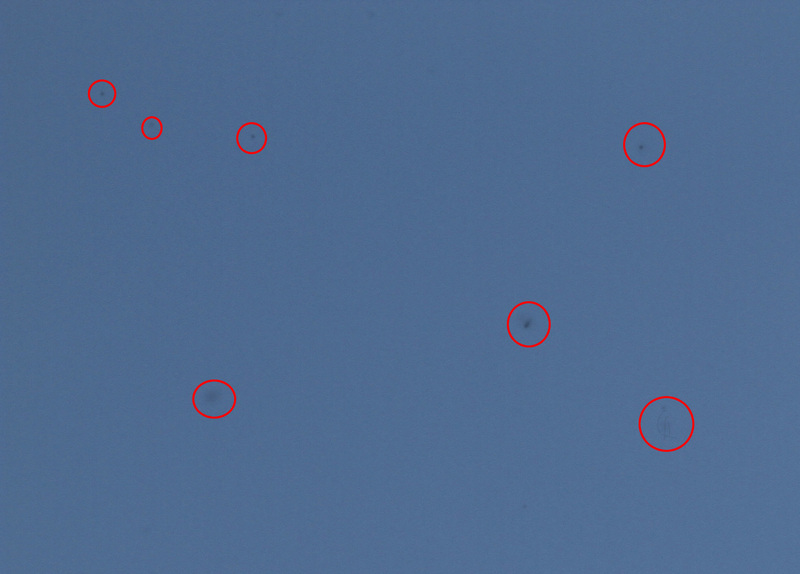 6) If you see some blurry dark spots, those are dust specks on the sensor. Time to Lean? Time to Clean! Dry Method or Wet Method? There are many different methods for cleaning sensors and much debate on which method is best. Generally speaking, they’re categorized as either “Dry” or “Wet”. The “Dry” method uses a blower (not compressed air!) and/or and special brush. The “Wet” method uses a special methyl alcohol solution and swab. The most challenging jobs will require both. 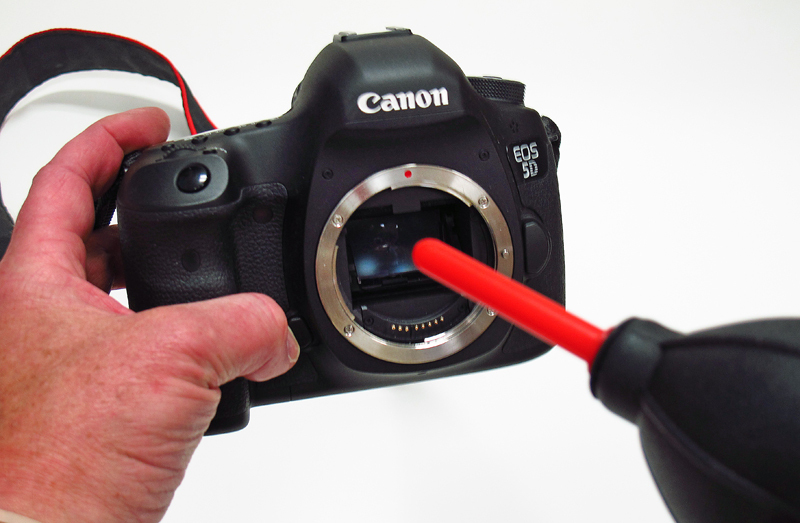 2) Activate the Manual Sensor Cleaning mode on your DSLR . Make sure the battery is fully charged before starting. 3) Use the “dry method” first by using a hand-held blower such as Giottos Rocket Air Blaster to dislodge any loose dust particles. It’s best to face the camera in a downward position while blowing off the sensor. 4) If needed, continue by using one of the many specially designed sensor-cleaning brushes. These are use micro fiber bristles that are specially treated for cleaning sensors. Do not use a small paintbrush. Those are too harsh and will scratch the sensor. For stubborn dust specks still remaining, you’ll need to switch to the ‘wet” method using a swab wetted with sensor cleaning solution. I prefer using Sensor Swabs (Type 2 for cropped sensors / Type 3 for full-frame sensors) and Eclipse Solution . 5) Apply a very small drop of the Eclipse solution to the SensorSwap and, working quickly, swipe across the sensor in a firm and smooth motion. The motion is similar to running a squeegee across a window. I work from left to right, then pivot the swab, and then work back right to left. 6) Discard the swab. Do not use it again. Don’t even think about it. If the sensor requires another pass, use a fresh swab. Repeat as needed. Cleaning your sensor can seem like a daunting task, but with the right tools, the instructions above, and some basic common sense, you can save a lot of time and money by doing it yourself.